Fully enclosed; pneumatics and wiring go through the arm, not strapped to the outside. Optional pneumatic or electric grippers, vacuum pickup, tool changers. Optional linear track, I/O expansion, bluetooth teachpad, TCP/IP. The R12-six is a complete self-contained six axis vertically articulated robot arm system designed as a cost effective solution for bench top automation. Applications include testing, sample handling, machine feeding. The hand terminates in a mounting plate for grippers, vacuum cups etc. R12-six is a very low cost entry to robotics, fast, accurate and reliable and easy to program yet capable of the most complex tasks. It has a useful 500mm reach. R12-six is a technological breakthrough in bench top robotics. 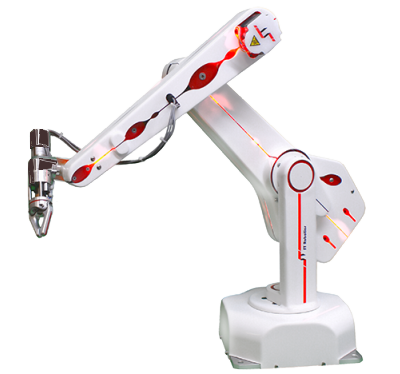 Based on the R12-500 it is a 6 axis articulated robot arm with a 500mm reach. It employs new light weight, high efficiency digital motors driving through steel reinforced polyurethane timing belts for the first 5 axes. The 6th axis is a unique way to make 6 axes optional, being an add-on module with a miniature stepping motor driving through a Swiss anti-backlash gearbox. Incremental optical encoders are optional on the first 5 axes providing exceptional integrity (see below). Do not let the low cost mislead you - this is not a hobby robot. It is a professional tool made to industrial standards of quality, reliability and performance, machined from solid alloy and finished with aesthetic acrylic covers. The system is supplied complete with controller, all cables, connectors, software, comprehensive manuals, ready to unpack and use immediately. The R12 package includes the K11 controller that is simple and reliable using a partnership of CPU and DSP micro-processors and compact micro-stepping drives. ROBOFORTH II embedded software gets you started easily yet permits the most complex motions, interfaces and peripherals to be programmed, assisted by ROBWIN project manager that brings everything together on one Windows screen. (repeatability and speed degrade with increasing payload and reach). Max torque, pitch or yaw: 1 Nm (repeatability figures degrade with increasing torque). Max torque, 6th axis roll: 0.25 Nm (repeatability figures degrade). Safety: Class 2 stop circuit, stall detect, risk assessment guide. High intensity LEDs along the arm serve as awareness barrier. Noise: Approx 40-50dB at 1m. warming up period. Figures for ISO 9283 available on request. The role of the encoders in the R17 and as an R12 level 1 option is as watchdogs. The loop is closed after completion of each individual motion which is not the same as servo control. The R12 encoder option comprises miniature optical incremental encoders fitted to each axis. Without encoders the R12 will run accurately and indefinitely open loop without error thanks to micro-stepping drives and accurate transmission. But if the robot suffers a collision then the controller does not know and carries on with the program even though the robot could be out of position. Such collisions usually only occur accidentally during programming and rarely during normal running. It is necessary to run the calibrate routine after such a collision. With the encoder option the controller notices the discrepancy immediately, stops the robot and announces an error. If the encoder option is not fitted ST provides a software solution in the form of a quick calibration check that can be included in every robot cycle or n cycles. If there is an error it is reported and the system stops. Note that the 6th axis itself does not have an encoder as the axis is too small and compact to fit one in. But this axis is wrist roll, very difficult to stall and can be individually recalibrated if necessary. As standard the robot terminates in a mounting flange (see diagrams below). 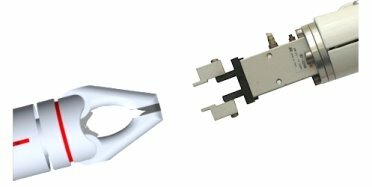 End effectors currently include: electric gripper, SMC 10mm pneumatic gripper, vacuum pickups, tool changers. Note: pneumatic gripper is shown with special fingers made for a particular application, not part of the option. Fingers to suit the clients product may be made by the client or ST.
up to 3m length, using a powerful motor and two recirculating crossed roller bearings. High resolution or high speed options. comprising 2 R12 robots on a programmable carousel. Two robot controllers are interlinked to synchronize the two robots. The maximum number of axes in total is 13. Arm comprises 2 limbs 250mm each plus 360 degrees base rotation. Therefore the workspace is a sphere 1000mm (40ins) in diameter (not including the hand). Service file with diagrams, setting up instructions and parts replacement instructions.